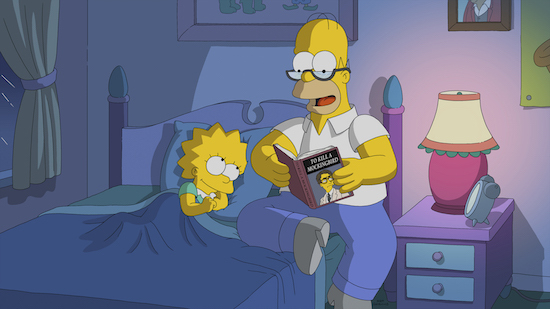 THE SIMPSONS: Homer being a softie with his kids tends to be some of the sweetest episodes of the show. (“Do it for her” gets me every time.) This was a lovely episode, and I appreciated that its pop culture reference was “To Kill a Mockingbird” versus something more timely. That sounds a bit odd, but a couple of the more recent bonding episodes were tied to very specific times—an IDOL-esque show and THE LEGO MOVIE—so this felt a bit more timeless. BOB’S BURGERS: The science fair was accidentally super timely, but Tina’s reasoning for why they should be trying to reach out to the aliens was both spot-on and perfect for the kids. Also, I had no clue there were really tiny coat racks! But of course they ended up saving the (rainy) day for Bob. Poor Linda couldn’t get her NOTEBOOK kiss, though. FAMILY GUY: Oh my goodness, how much time did the last name reciting/repeating take up? Way to commit to a bit! Also, I definitely thought about how many takes that might have taken Seth MacFarlane to get through all of those names (albeit probably in pieces) as he had to do both Stewie and Brian’s take on Pip’s full last name.